It’s time for Sonderling Sunday, that time of the week when I play with language by looking at the German translation of children’s books — or, um, not. 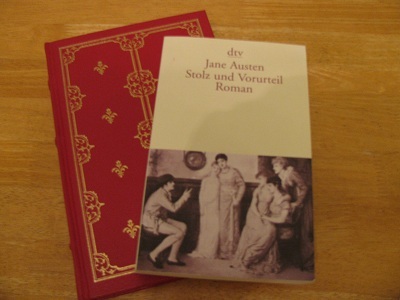 Today I’m going to tackle that classic masterpiece of romance novel, Pride and Prejudice, Stolz und Vorurteil. Okay, how is that immortal thought expressed in German? Es ist eine allgemein anerkannte Wahrheit, da? ein alleinstehender Mann, der ein beträchtliches Vermögen besitzt, einer Frau bedarf. “how can you be so tiresome!” = wie kannst du nur so schwer von Begriff sein! “You delight in vexing me.” = Es macht dir Vergnügen, mich zu quälen. Then the German has Schlagfertigkeit, which translates as “quick-witted,” so maybe that’s the “quick parts”? Maybe there’s something about occasional violence in the original British version?!? = Ihre Lebensaufgabe war es, die Töchter zu verheiraten — ihre Freude, Besuche zu machen und Neuigkeiten zu erfahren. Next week, I’ll be back to Der Orden der Seltsamen Sonderlinge, which I hope you’ll find viel Empfehlenswertes. The Penguin Press, New York, 2011. 255 pages. I’m a huge Jane Austen fan. I wrote a paper on her my Sophomore year of college. I had lots of time in which to write the paper — so I read ALL her novels, and then wrote the paper staying up all night the night before it was due. A Jane Austen Education is perhaps my favorite so far of nonfiction Jane Austen take-offs. William Deresiewicz was a graduate student of literature, and he writes about how things he learned from Jane Austen mirrored and informed his life as he became an adult. He’s not afraid to pull out lessons that he needed to learn, and there’s a lovely combination of personal observations and stories with ideas and examples from the novels. I was twenty-six, and about as dumb, in all human things, as any twenty-six-year-old has a right to be, when I met the woman who would change my life. That she’d been dead for a couple of hundred years made not the slightest difference whatsoever. Her name was Jane Austen, and she would teach me everything I know about everything that matters. He goes through all the novels, matching them up to different periods of his life. There’s lots and lots of good stuff here. He has studied all the novels and studied Jane Austen’s life, so he has plenty of information to convey, and along the way, he comes up with some profound insights and self-deprecating humor. I’ll include at least one paragraph from the chapter on each novel, but there’s a lot more where this comes from. 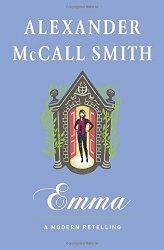 There was one more thing about my life that had to change, now that I’d read Emma: my relationships with the people around me. Once I started to see myself for the first time, I started seeing them for the first time, too. I began to notice and care about what they might be experiencing, and they began to develop the depth and richness of literary characters. I could almost feel along with their feelings now, as we talked, feel the contours of them as they tried to express them to me. Instead of a boring blur, the life around me now was sharp and important. Everything was interesting, everything was meaningful, every conversation held potential revelations. It was like having my ears turned on for the first time. Suddenly the world seemed fuller and more spacious than I had ever imagined it could be, a house with a thousand rooms that now lay open to explore. But Austen, it turned out, did not see things that way. For her, growing up has nothing to do with knowledge or skills, because it has everything to do with character and conduct. And you don’t strengthen your character or improve your conduct by memorizing the names of Roman emperors (or American presidents) or learning how to do needlework (or calculus). You don’t do so, she believed, by developing self-confidence and self-esteem, either. If anything, self-confidence and self-esteem are the great enemies, because they make you forget that you’re still just a bundle of impulse and ignorance. For Austen, growing up means making mistakes. Catherine thought she saw things at Northanger Abbey that weren’t really there, but the novel, my professor explained, was not against imagination. Quite the opposite. It was against delusion, against projection, against thinking the same old thing again and again, whether it’s the idea that all balls are “very agreeable indeed” or that all old houses conceal dark secrets. True imagination, he went on, means the ability to envision new possibilites, for life as well as art. Mrs. Allen and the rest of Austen’s dull adults were not ignorant or stupid so much as they were unimaginative. Nothing was ever going to change for them, because they couldn’t imagine that anything ever would. How different this was, I realized, from the kinds of stories I had trained myself to tell my friend and his wife, those polished little anecdotes that had to have a laugh at every turn. “You shall tell me all about your brothers and sisters.” All about: no impatience, no competitiveness, no interruptions, no need to worry about being entertaining, no having to watch your listeners’ eyes glaze over while they thought about what they were going to say when you finally stopped talking already. Did Edmund really care about her brothers and sisters? Probably not. But he cared about her, and she cared about them, and that was enough for him. To listen to a person’s stories, he understood, is to learn their feelings and experiences and values and habits of mind, and to learn them all at once and all together. Austen was not a novelist for nothing: she knew that our stories are what make us human, and that listening to someone else’s stories — entering into their feelings, validating their experiences — is the highest way of acknowledging their humanity, the sweetest form of usefulness. Putting your friend’s welfare before your own: that was Austen’s idea of true friendship. That means admitting when you’re wrong, but even more importantly, it means being willing to tell your friend when they are. It took me a long time to wrap my head around that notion, because it flew so strongly in the face of what we believe about friendship today. True friendship, we think, means unconditional acceptance and support. The true friend validates your feelings, takes your side in every argument, helps you feel good about yourself at all times, and never, ever judges you. But Austen didn’t believe that. For her, being happy means becoming a better person, and becoming a better person means having your mistakes pointed out to you in a way that you can’t ignore. Yes, the true friend wants you to be happy, but being happy and feeling good about yourself are not the same things. In fact, they can sometimes be diametrically opposed. True friends do not shield you from your mistakes, they tell you about them: even at the risk of losing your friendship — which means, even at the risk of being unhappy themselves. If love begins in friendship, I was now able to see, it has to adhere to the principles of friendship as Austen understood them. The lover’s highest role, like the friend’s, is to help you to become a better person: push you, if necessary, even at the risk of wounded feelings. Austen’s lovers challenged each other: to be less selfish, more aware, kinder, more considerate — not only toward each other but to everyone around them. Love, I saw, for Austen — and what a change this was from the days of my rebellious youth — is an agent not of subversion, but of socialization. Lovers aren’t supposed to goad each other toward extremes of transgression, the way that Marianne and Willoughby did; they’re supposed to teach each other the value of behaving with propriety and decorum, show each other that society’s expectations are worthy, after all, of respect. Love, for Austen, is not about remaining forever young. It’s about becoming an adult. Now, undoubtedly, my knowledge of all the Austen novels contributed to my enjoyment of this book, but I have little doubt that it would also encourage people to read the novels who haven’t before. All in all, it’s a wonderful contribution to Austenalia, a delightful, thoughtful, even scholarly contribution, and from a male perspective, as a nice contrast to so many others. I highly recommend that Jane Austen fans read this book. Source: This review is based on my own copy, which I got at an ALA conference. I read Austenland when it first came out, but 2007 was a hectic year for me, what with finishing up my MLIS degree and working half-time and desperately needing a full-time job (and eventually finding one). So I didn’t get a lot of books reviewed that year, and never did post a review of this book. Jane Hayes wasn’t rich enough to go there on her own steam, but her great-aunt Carolyn spots Jane’s hidden DVD of Pride and Prejudice starring Colin Firth, and Aunt Carolyn figures out Jane’s obsession. She has some wise words about figuring out what’s real. Jane lay back down, but this time placed the throw pillow under her head. Okay, all right, she would go. It would be her last hurrah. Like her friend Becky, who’d taken an all-you-can-eat dinner cruise the night before going in for a stomach stapling. Jane was going to have one last live-it-up and then quit men entirely. She’d play out her fantasy, have a staggering good time, and then bury it all for good. No more Darcy. No more men — period. When she got home she’d become a perfectly normal woman, content to be single, happy with her own self. She’d even throw away the DVDs. Well, needless to say, things don’t turn out quite as Jane expects. Along the way, we’ve got all kinds of fun and of course some mistaken first impressions. This is a light and fluffy book, and so much fun. Clearly, Shannon Hale filled it with love and respect for Jane Austen, and she pulled off an appropriate tribute that’s a wonderful book in its own right. Source: This review is based on my own copy, purchased from Amazon as soon as it was published. Balzer + Bray, 2012. 407 pages. Wow. I’ve always loved Jane Austen’s Persuasion. The poignancy runs extra deep since Anne Elliot allowed herself to be persuaded to reject Captain Wentworth’s suit years ago. When he returns, successful and sought after, what can she do? For Darkness Shows the Stars is a retelling of Persuasion in a science fiction setting. Diana Peterfreund keeps all the poignancy of the romantic situation, but adds layers of complexity involving technology and responsibility. The story takes place on unknown islands of a post-apocalyptic Earth. Our descendants played with genetic engineering until they met with disaster. The survivors hid for years in caves. They proudly name themselves the Luddites. They did not use technology to play God, and so God allowed them to survive. Now their descendants are the rulers and estate owners. The descendants of the Lost were Reduced — mentally deficient, barely able to speak two words. The Reduced work the land, and the Luddite lords have a responsibility to care for them well. Eighteen years ago, three babies were born on the same day on the North estate. Elliot North will grow to manage her father’s estate. Ro is Reduced, and loves Elliot and loves color and beauty, but her mental powers are not strong. Then there’s Kai. He’s Post-Reduction. He has full mental powers. But because his grandparents were Reduced, he doesn’t have the rights of the Luddite lords. He works on the estate and becomes friends with Elliot. But he can never be her equal. Four years ago, Kai left the estate and asked Elliot to join him. But she can’t leave her responsibilities. Her mother died, and her father and sister were only interested in horses and status, not in running the estate and doing what’s best for all the people who live there. Now Kai has returned. The North family has been forced to rent her grandfather’s boatyard to a prosperous group of Posts who are making a fleet of ships to explore the seas around the islands. They have already met with much success. The group has rejected their background on estates and chosen multisyllabic names for themselves. Admiral Innovation and his wife bring along a promising young captain, Malakai Wentforth. Elliot’s father and sister don’t even recognize that he is Kai returned. But she is all too aware. Kai is back, and he’s angry for being rejected. Diana Peterfreund did a marvelous job paralleling the plot of Persuasion. And so doing, she keeps all the poignancy of the original, all of Elliot’s pain that she was the one who did the rejecting. And now Captain Wentforth has succeeded beyond her wildest dreams, and she’s the one in difficult straits. He is far more interested in the daughter of the neighboring estate. And why shouldn’t he be? She also adds complexity. The Luddites have strict protocols against overusing technology. But Elliot has been experimenting with better strains of wheat in order to feed the people on her estate. What is right? And then what about the Posts who come stretching the limits of what is acceptable? Are they inviting another apocalypse? In this book, the somewhat silly accident in the middle of Persuasion takes on whole new significance when it leads to a revelation about the Posts. Knowing the outline of what was going to happen made the story that much more compelling, and I was all the more surprised by some of the twists the author inserted. They didn’t change the romance, but they did add to the story. To some Luddites, the Reduced were children, fallen and helpless, but still human. To others, they were beasts of burden, mostly mute and incapable of rational thought. Elliot’s mother had taught her that they were her duty, as they were the duty of all Luddites. Cut off as the population of these two islands had been since the Wars of the Lost, they might be the only people left on the planet. The Luddites, who had kept themselves pure of the taint of Reduction, therefore had the responsibility to be the caretakers not only of all of human history and culture but of humanity itself. It had been generations since any Luddites had tried to rehabilitate the Reduced. Mere survival had taken precedence. But Ro was more than Elliot’s duty. She’d become Elliot’s friend, and sometimes Elliot even dared wonder what Ro could be — what any Reduced could be — if the Luddites had the resources to try. The strength of Persuasion lies in the history between the two characters. In For Darkness Shows the Stars, the author plays on the history by inserting letters Elliot and Kai exchanged through the years as children growing up together. Their friendship was never sanctioned, so they placed letters in a knothole in the barn, a knothole Elliot can’t stop checking, even now. This is a magnificent retelling of a classic romance. A story of lost love and regret and redemption mixed with genetic engineering and tampering with technology and divine right and responsibility to rule. Not a book I could stop reading before I’d finished. Alfred A. Knopf, New York, 2011. 291 pages. When I heard that a stellar and distinguished British mystery writer was going to tackle a mystery sequel to Pride and Prejudice, I knew I had to read it! I’ve read a lot of Jane Austen knock-offs and love them (see the Austenalia category), but not all the authors were ones I’ve heard of before. I will confess that I’d never read a P. D. James book before this one. I’d long meant to, and saw a movie based on Children of Men, but have never quite gotten around to it. Still, I was surprised when I liked the Pride and Prejudice sequel aspects of this book more than I did the mystery. Before I criticize, let me say that I loved reading this book. It was a delight, and I recommend it to all other Jane Austen fans. I’m going to point out some ways it wasn’t perfect, but it was still very very good and tremendously enjoyable. So please keep that in mind! I admit I was delighted with her choice of victim and suspect. P. D. James brings back most of the important characters from Pride and Prejudice. The Prologue nicely sets the stage, and fits absolutely well with what Jane Austen said at the end of her book about how her characters’ lives continued. Preparations for a ball at Pemberley are interrupted by a murder. Shucks. It would have been fun to get to read about a ball at Pemberley. Georgiana is considering two suitors, but her choice is settled very easily. Some romance and romantic scenes and misunderstanding and revelation would have been nicely in the spirit of Jane Austen. My biggest objection is that the mystery was not solved by our main characters. When all has been resolved, Darcy is simply informed of the resolution. Sure, we had some clues and some suspicions, but not really enough to solve the crime, and it ended up pretty much being luck that let the truth come out. I would have liked it much better if Elizabeth had solved the crime, coming up with the crucial information, or, next best, Mr. Darcy. I also was kind of annoyed by an ending talk between Elizabeth and Darcy. They discussed things that they’d already cleared up at the end of Pride and Prejudice. This was unnecessary. She really got the spirit of the characters and the society. Without petty tricks like imitating Pride and Prejudice‘s first line. She brought back so many characters from the original book. Even Mr. Bennett visits for awhile, just as Jane Austen mentioned he was wont to do. She made the legal process at that time, with magistrates and the inquest and trial process, very clear and easy to understand. Most of all, I felt like I was spending time with my beloved characters again. Definitely a treat for fans of Pride and Prejudice! Bloomsbury, New York, 2012. 277 pages. I’m interrupting my posting of my 2011 Sonderbooks Stand-outs to write a review of a book that will most definitely be a 2012 Sonderbooks Stand-out, if not my favorite book of the whole year. Shannon Hale’s Austenland was a 2007 Sonderbooks Stand-out, though that was the year I was working on my Master’s in Library Science and didn’t get very many reviews written. The idea is a fun one, playing off all the Jane Austen frenzy that continues to happen in our time. It’s about a young woman who goes to what is essentially a Jane Austen theme park in England. Guests come to an English manor and are submerged in Regency culture and finish off their vacation with a ball. The original book parallelled Pride and Prejudice in many ways and was a fun and romantic read. In Midnight in Austenland, Shannon Hale has surpassed herself. Now, I should say that this book is particularly delightful to me because this time the heroine is a divorced mom whose husband cheated on her. I definitely related to her and her feelings as she worked through the divorce. She felt like a complete idiot because she hadn’t seen the clues that he was cheating, and as the book goes on, it dawns on her just how long he had lied to her. It’s very easy to see — when it’s someone else — that she should not beat herself up for believing someone who vowed to be true to her. But I completely related to all her turmoil about it. I also loved this book because I am a Jane Austen aficionado. In college, I wrote my English Literature research paper on Jane Austen. I had more than a month to write it — so I spent the time reading ALL her novels and wrote the paper staying up all night the night before it was due. 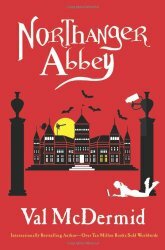 Pride and Prejudice is definitely my favorite, but Northanger Abbey is the most light-hearted and just plain fun. Midnight in Austenland parallels Northanger Abbey in so many beautiful ways. In fact, the similarities enhanced the story. You see, Charlotte, our heroine in Midnight in Austenland is playing a “Bloody Murderer” game after the lights go out. In the dark, lit only by a flash of lightning, she is in a secret room and touches a cold hand attached to a covered dead body. But when Charlotte goes back the next day, there is no body. Did she imagine it in the dark, in the night? In fact, is this book simply paralleling Northanger Abbey, in which silly Catherine Morland imagines a murder has taken place where there was none? I don’t want to say too much more because I don’t want to give away any delicious details. I did like that Charlotte has been reading Agatha Christie, so there was still a tribute to novel-reading, as Catherine Morland had been reading The Mysteries of Udolfo. Again, we weren’t sure if Charlotte was drawing conclusions because she’d read too many detective novels. I think I can stay spoiler-free if I simply comment that this book has the best heroine-escapes-from-deadly-peril scene EVER! In short, Shannon Hale combines lots of humor with Jane Austen parallels, romance, suspense, mystery, gothic themes, and eerie atmosphere in a book that will make divorced women everywhere feel empowered. You can read Midnight in Austenland without having read Austenland, though I do recommend reading both. The heroines and their stories are different — they are just at the same theme park with some of the same actors and the same administrator. “No one who knew Charlotte Constance Kinder since her youth would suppose her born to be a heroine. She was a practical girl from infancy, only fussing as much as was necessary and exhibiting no alarming opinions. Common wisdom asserts that heroines are born from calamity, and yet our Charlotte’s early life was pretty standard. Not only did her parents avoid fatal accidents, but they also never locked her up in a hidden attic room…. “We may never know what turned once-nice James away. Was it the fact that his wife was making more money than he was? (A lot more.) Or that his wife had turned out to be clever? (That can be inconvenient.) Had Charlotte changed? Had James? Was marriage just too hard to maintain in this crazy, shifting world? “Charlotte hadn’t thought so. But then, Charlotte had been wrong before. “She was wrong when she assumed her husband’s late nights were work-related. She was wrong when she blamed his increasingly sullen behavior on an iron deficiency. She was wrong when she believed the coldness in their bed could be fixed with flannel sheets. “Poor Charlotte. So nice, so clever, so wrong. “Charlotte came to believe that no single action kills a marriage. From the moment it begins to stumble, there are a thousand shots at changing course, and she had invested her whole soul in each of those second chances, which failed anyway. It was like being caught in her own personal Groundhog Day, only without the delightful Bill Murray to make her laugh. She would wake up, marvel anew at the bone-crushing weight in her chest, dress in her best clothes, as if for war, and set out with a blazing hope that today would be different. Today James would remember he loved her and come home to the family. Today she would win back her marriage, and her life. “Eventually the time came when Charlotte sat in the messy ruins of her marriage and felt as weak as a cooked noodle. She would never be nice or clever enough. Hope had been beaten to death. She dried her eyes, shut down her heart, and plunged herself into an emotion coma. So much easier not to feel. Source: This review is based on my own book, which I pre-ordered via Amazon.com. You are currently browsing the archives for the Austenalia category.